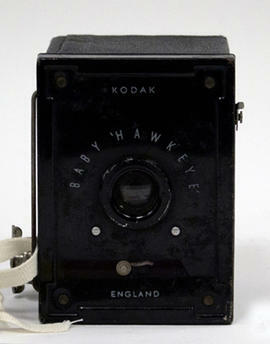 Item is a simple box camera with a leatherette covering, marked as J-B Ensign on the front. The camera uses 2 1/4B (E20) rollfilm for 6x9cm exposures. It has a meniscus lens, a two-speed shutter, and two reflecting type viewfinders. Packaging for photographs, used by various photolabs or photographic developers to deliver finished prints to the consumer. All used, open and empty. File contains catalogues and price lists published by Optical Works G. Rodenstock, Munich detailing the universal lenses and shutters offered by the company. Portrait of Earl of Strafford holding a top hat and cane. File consists of 3 theatre programs published by Cambridge Theatre in 1971, 1972, and 1988. File consists of theatre programspublished by playbill for the Saville theatre. Productions include: On the Level, The Wild Duck, Valmouth, The Way of the World, The Rivals. File consists of theatre programs published by Whyndham's Theatre. Productions include: The Prime of Miss Jean Brodie, The Boy Friend, A Taste of Honey, Abelard and Heloise. File consists of theatre programs published by Westminster Theatre. Productions include: Dear Delinquent, Relative Values. File consists of theatre programs published by Vaudeville theatre in London. Productions include: Arsenic and Old Lace. File consists of theatre programs published by playbill for the Strand theatre. File consists of 1 theatre programs published by playbill for the St. Martins theatre in London. Productions include: Sleuth!, The Killing of Sister George. File consists of theatre programs published by Savoy Theatre. Publications include: Relative Values, Noises off, Lloyd George Knew My Father. File consists of 5 theatre programs published by Sadler's Wells Theatre in 1958, 1969, and 1981. File consists of 2 theatre programs published by Royal Lyceum Theatre in 1967, and 1971. File consists of 17 theatre programs published by Theatre Royal Drury Lane in 1957, 1958, 1985 and 1990. File consists of 7 theatre programs published by the Royal Court Theatre in 1956, 1957, 1958, and 1971. File consists of 1 theatre program published by Regent's Park Open Air Theatre in 1972. File consists of 5 theatre programs published by Queen's Theatre in 1966, 1971 and 1972. File consists of theatre programs for productions at the Prince of Wales Theatre, London. Productions include: Cat Among the Pigeons, Under the Arches. File consists of theatre programs for productions at the Prince Edward Threatre, London. Productions include: Showboat. File consists of 1 theatre program published by Pitlochry Festival Theatre in 1971. File consists of 5 theatre programs published by Piccadilly Theatre in 1962 and 1966. File consists of 6 theatre programs published by Phoenix Theatre in 1952, 1956, 1957, 1963, and 1988. File consists of theatre programs published for the Palace Theatre, London. Productions include, Classical Theatre of China, On Your Toes, The Entertainer, Le Misanthrope. File consists of theatre programs published for the Old Vic Theatre Company, London. Productions include, The Winter's Tale, King Henry V, Antony and Cleopatra, King Henry VIII, Mary Stuart. File consists of theatre programs published by the New Theatre in London. Productions include; Under Milk Wood. Summer of the Seventeenth Doll, Anne of Green Gables, Oliver!, The Winslow Boy. File consists of 5 theatre programs published by Mermaid Theatre in 1963, 1968, 1972, and 1974. File consists of theatre programs published by Lyric Theatre in London. Publications include; Da, Filumena, Swansong, Weir, Emerald City, Robert and Elizabeth. File consists of 6 theatre programs published by Her Majesty's Theatre. Productions include: The Teahouse of the August Moon, West Side Story, The Phantom of the Opera. File consists of theatre programs published by the Golders Green Hippodrome. Productions include: Cranks, The Diary of Anne Frank, Paris Not So Gay, Bell Book and Candle, Moscow State Variety Theatre. File consists of 6 theatre programs published by the Globe Theatre in 1972, and 1987. File consists of 3 theatre programs published by Garrick Theatre in 1969, and 1988. File consists of 3 theatre programs published by Criterion Theatre in 1956. File consists of 4 theatre programs published by Comedy Theatre in 1958, and 1972. File consists of 3 theatre programs published by Chichester Festival Theatre in 1966. File consists of 2 theatre programs published by Duke of York's Theatre in 1968. File consists of 4 theatre programs published by Apollo Theatre in 1968 and 1982. File consists of 1 theatre program published by Aldwych Theatre in 1988. File consists of 3 theatre programs published by Albery Theatre in 1963, and 1974. File consists of 3 theatre programs published by Adelphi Theatre in 1958, 1962, and 1965. Series consists of theatre programs published in London, England. Item consists of two 22 exposure rolls of Kodak Verichrome Pan Film for Black-and-White Prints ASA 125 in original packaging. Develop before date is October 1976. Item consists of a 19 exposure roll of Ektachrome-X Daylight or Blue Flash Ex 160 Colour Film for Colour Slides in original packaging. Develop before date is July 1976. Price sticker reads: "Toronto/ Camera / $1.79 each". Item is a box of Kodak Bromide paper for 3 1/2 x 4 1/2 inch black and white prints. Contains 100 sheets. Package has been opened and some sheets removed. Item is an envelope of Kodak photographic paper, Bromesko WFL.3D for black & white prints 3 1/2 x 4 1/2 inches. Contains 25 sheets. Package has been opened. Item is an envelope of Kodak Velox paper for 2 1/2 x 2 1/2 inch prints. WSG.2S. Contains 25 sheets. Package has not been opened. Item is an envelope of Kodak Bromide paper for 3 1/2 x 4 1/4 inch prints. Originally contained 25 sheets. Package has been opened and used. Item is a group of red film, cut with square opening used to produce white borders on prints from negatives sized 2 1/2 x 3 1/2 inches down to 35mm. 30 page informational booklet published by the Eastman Kodak Company detailing how photographic lenses function and are made. Includes a list of Kodak lenses avaialble at the time. Item is a snapshot viewfinder camera model made for use with 127 film. It has a black Bakelite plastic body with front metal plate. It was extremely popular in the UK. 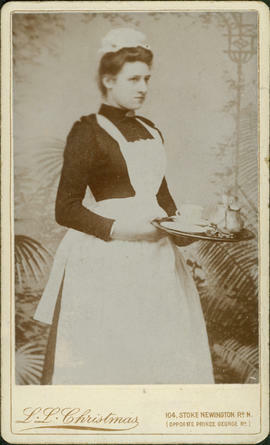 Item is a cabinet card portrait of Queen Victoria. File contains catalogues and price lists published by the Zeiss Ikon, detailing Contax cameras and lenses. File contains a catalogue and instruction manual published by the Photo-Materials company detailing the Trolonet box camera. File contains catalogues published by the Wollensak Optical company detailing professional studio lenses available. File contains pamphlets detailing the Palko roll film cameras, manufactured by the Cruver-Peters Company, later known as Palko Inc.
A 107 page catalogue published by Kodak Limited featuring products for motion picture and still photography for medical purposes.